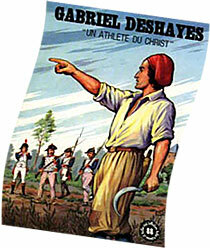 Gabriel Deshayes was born on December 6th, 1767 in Beignon, a small rural village of Morbihan, on the border of the forest of Paimpont. When the French Revolution broke out, he was still a Seminarian and was ordained Deacon in September, 1790. To become a priest, he had to join Jersey where Mgr. Le Mintier, Bishop of Tréguier in exile, ordained him on March 4th, 1792. He might have waited there. He took a risk and returned to France, eight days after his ordination. He began his ministry as a banned priest, exposed to the most serious dangers. He found several of his colleagues. Their assembly point was the parish of the Verger. With the greatest discretion, they travelled through the countryside at night, gathered Christians in their barns or their attics, for the celebration of Mass and Sacraments. 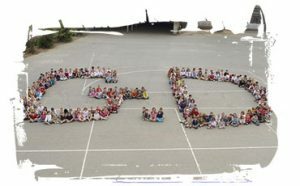 In this team, Gabriel was the youngest, the most intrepid also, as it was said. To mislead the soldiers of the Revolution, he disguised himself as a miller, as a farmer who handles a scythe in the Breton moor, as a farm-labourer who was sent into the fields and who was called “Grand Pierre” ! He narrowly escaped death several times ! One day, the house where he was hidden was surrounded by soldiers: “Yes, yes, it is said. Deshayes is here, I am sure of that, Let us look, citizens”. And, he disappeared into the crowd. On many other occasions, Gabriel Deshayes escaped the soldiers who pursued him, and during the more serene days of the Consulate, he was available for a quieter ministry. It is in April, 1805 when Gabriel Deshayes arrived at Auray, a parish of 3000 inhabitants. He tackled diverse emergencies which his sense of God and of man made him spot them out soon. He helped in the restoration of the home which still gathered at that time old men, disabled persons and abandoned children. He worried about beggars and about unemployed persons and enlisted them for a community work. He opened a textile mill and created a weaving workshop for prisoners. His presbytery was always solicited, and the priest deprived himself of his coat or a blanket to help a needy family. In the streets of Auray, he met hearing-impaired people. At that time, they were called deaf persons. Easily, they are treated as idiots or as stupid ones. Gabriel Deshayes was moved. From 1810, he entrusted the girls to the Sisters of Wisdom, at the Chartreuse which he had just acquired. 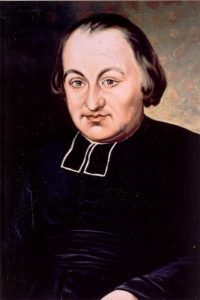 Later, he entrusted the boys to the Saint Gabriel Brothers and developed his work in favour of the blind persons and the partially-blind persons. During His life, they will be his favorite children. From 1816, he welcomed in his presbytery the young people that with the help of the Brothers of the Christian Schools he prepared as teachers for the Breton countryside. United to the recruits of Fr. de la Mennais in Saint-Brieuc, these young people formed the first core of the Institute of the Brothers of Christian Instruction of Brittany. Further to a set of circumstances, Father Deshayes was called to Saint-Laurent-sur-Sèvre where, on January 17th, 1821, was elected Superior general of the Montfort Fathers and the Sisters of Wisdom. During twenty years, he filled this responsibility. At the same time, he took care of the Sisters of Christian Instruction that he established at Beignon and bought for them a property in Saint-Gildas-des Bois: it will be their Mother House. Rapidly, he entrusted the management of his institute to the Vicar-general of Nantes, Fr. Angebault. Likewise, he confided to Fr.de la Mennais the high direction of the Brothers of Ploërmel. He had enough work, because in Saint-Laurent-sur-Sèvre, he managed the Montfort Congregation, boosted with the Saint Gabriel Brothers his work of instruction of the countryside started in Auray, established, in the diocese of La Rochelle, a Congregation of farming Brothers, the Brothers of Saint Francis of Assisi and helped Fr.Ormières to establish the institute of the Sisters of the Guardian Angel,in Quillan, in the diocese of Carcassonne.